Gingival Graft in Parkersburg, WV | Richard Newhart, D.D.S. A gingival graft is a surgical periodontal procedure aimed to stop further gum recession. The covering of exposed root surfaces accomplishes a number of objectives: the prevention of further root exposure, decreased or eliminated sensitivity, decreased susceptibility to root caries and cosmetic improvement. 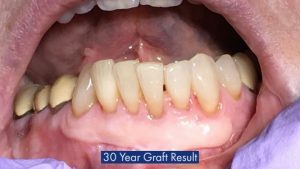 A free gingival graft is a procedure where a small layer of tissue is removed from the palate of the patient’s mouth and then relocated to the site of gum recession. It is sutured (stitched) into place and will serve to protect the exposed root as living tissue. The donor site will heal over a period of time without damage. This procedure is often used to increase the thickness of very thin gum tissue. Before and after surgery L.A.N.A.P.